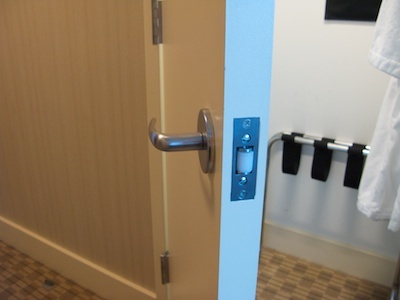 During my recent visit to Macworld 2010 in San Francisco, I ran into a few issues with two door handles in my hotel room. How can something as simple as a door handle be anything but perfectly easy to use? In my home country, the predominant door handle design is that of a horizontal bar mounted to a rotating axle at one end: to open the door, you push down on the horizontal bar to disengage the door lock, and then push or pull to move the door. 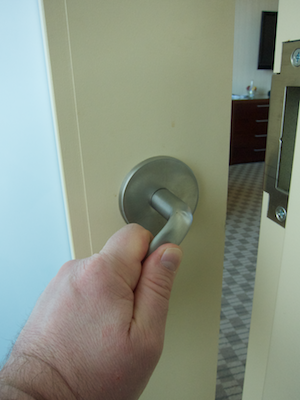 The closet door’s handle in my hotel room looked exactly like one of those. There is, however, a minor, yet important peculiarity about this exact specimen: although the round axle and faceplate provide visual clues that its axle can rotate, the handle is mounted fixed into this position. Unlike most other handles of this type, this one cannot be pushed down. There is simply no need for this, because the door is held in the closed position by a roller catch. Although you realize this fact as soon as you open the door for the first time, my mental model of this type of door handle is so deeply ingrained in my brain that even after a couple of days in this room I kept intuitively pushing down on the handle almost every time I wanted to access the closet. The few times I managed not to do this, a conscious mental effort was required to remind myself of how this specific handle works. This is a neat example for what happens when a device’s visual appearance conforms to a mental model that the user has developed for a type of device, while its actual operation differs considerably from that mental model. It would make for interesting research to analyze whether users who grew up in a country where rotating door knobs are more popular than the horizontal-bar-on-an-axle kind, would have the same problems with this closet door handle that I had. Would they have developed a mental model that is anchored as strongly in their subconscious as mine is, or would it be easier for them to grasp, and adapt to, this specific model, because they have no experience with how this handle design usually works? 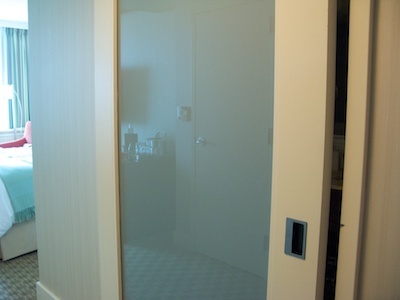 The hotel room’s bathroom door is an elegant-looking large sliding door with a frosted-glass panel, but the design of its door handles creates a few rather un-elegant functional issues. To move the door, you push with your fingertips against the left or right inner vertical walls of a rectangular recess in the side of the door. This design requires you to switch hands or at least change your hand’s position, whenever you want to change the direction in which you move the door. This is problematic, because the sliding door is rather heavy, so when you open it with too much force, it will gain enough momentum to noisily bump against the end-stop and rebound a few centimeters.1 Due to the handles’ design, however, the door will have crashed into the end-stop well before you are able to get a proper grip on the handle. What’s more, as you can see in the photo above, the handle recess is partially covered with a metal plate that is rather thin. Oftentimes when you open the door, the edge of this plate will cut into your fingers, which, due to the door’s weight, is very unpleasant, if not painful. Interestingly, the problems outlined above could be fixed easily by exchanging the handles between the closet and the bathroom doors. The closet door’s hinges and its position in the door frame provide sufficient visual clues about how this door will move. Mounting the recessed handle on the closet door would afford the required pulling motion by having the user curl her fingers behind the front plate. Since pulling the door open requires force to be applied to the inside pane of the handle’s front plate instead of to the inner vertical walls of the recess, the front plate would not cut into the user’s fingers. With the handle’s front plate facing away from the door hinges, the user would have to use her hand that is facing towards the hinges when standing in front of the door. That hand would also be in a natural position to grab the door’s edge to prevent it from flying open and smashing into the wall. Using the closet door’s handle on the sliding bathroom door, on the other hand, would literally afford a “good grip” on the door. 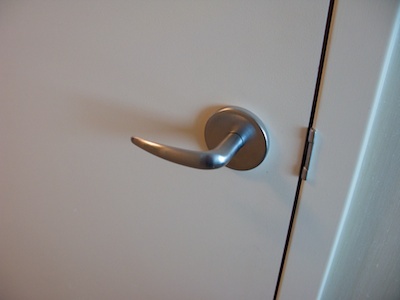 If the handle pointed towards the floor, this vertical mounting position would allow the user to open and close the door without having to change hand positions, and it would also provide an additional visual clue that this is a sliding door. Update 2011-02-08: Just recently, I stayed at this hotel again. This time, instead of the fancy sliding door, a hinged door graced the entrance to my room’s bathroom. Since this door is equipped with a latch mechanism, opening the door requires you to push down on the door handle — which looks identical to the fixed-in-place one on the clothes closet. With two identical-looking but differently-behaving handles in one room, I happened to press down on the closet’s non-moving handle a few times during my stay, and I also tried to pull open the bathroom door without pushing down on its moving handle every now and then. Unfortunately, the handles’ beautiful, elegantly sleek curves provide only poor consolation for the fact that their specific application in this hotel room violates a fundamental rule of user interface design: user interface elements that are perfectly identical in visual appearance should also be perfectly identical in the ways they operate.